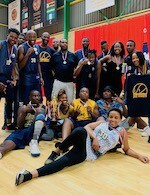 Soweto Panthers have been crowned BNL champions. 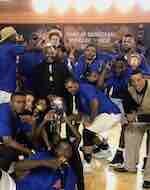 They beat Egoli Magic in the Final tonight. Reece Prinsloo (203-C-91) stepped up with 20 points and 11 rebounds to lead the charge. Soweto dominated from start to finish. They grabbed a 41:22 halftime advantage. The Panthers used a 24:12 run in the third term to take a comfortable 31-point lead. Egoli dropped 24 points in the fourth quarter but could not avoid the loss. Tatenda Maturure (G/F-98) produced 15 points for the Panthers. Tony Chukwurah replied with 18 points and 8 rebounds for the Magic.